The Fan Waves was a new quilt block to me. I am not even sure this is the correct name for this block, but I liked it. 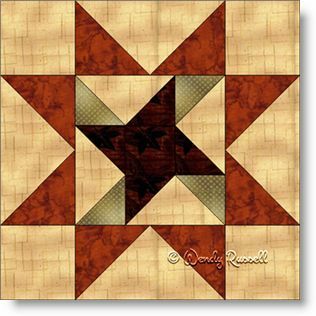 This quilt block features half square triangles in two different sizes, as well as quarter square triangles (which become the "goose" part of the flying geese unit). When you put it all together, you see a pinwheel (or a fan) in the centre of a star. All in all a good use of different patches, which results in a wonderful learning experience. The sample quilts illustrated give you ideas of how to make a quilt that is totally different than your "neighbour", if you happen to be using this block in quilt class. Enjoy!